In the past, when a patient needed an X-ray, the referring doctor would write an order, hand it to the patient, and send him on his way. Today, evolving technologies and continuously changing coding rules have helped create a new environment in which gaining maximum reimbursement for any particular healthcare service is anything but guaranteed. For example, many referring physicians now use EMRs to convey orders for their patients, and every year new CPT and ICD-9 diagnosis codes are introduced to the healthcare arena. 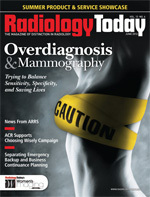 Add to that the growing concern among all healthcare professionals about when ICD-10 will finally become a reality, and it becomes clear that radiology professionals could benefit from a refresher course in the hows, whats, and whys of basic radiology coding in an effort to gain maximum reimbursement for their work. • Referring physician orders: A referring physician’s order can be written, phoned in, or sent via EMR. Thus begins the process of handling a new patient, from check-in to performing the exam to processing the films. When looking at an imaging order, it’s important to determine whether the referring physician has provided the appropriate documentation and whether it meets medical necessity. The documentation should include signs and/or symptom(s) and the relevant history (including known disease/diagnoses). This information should justify performing a specific imaging exam. For example, the terms “fall,” “trauma,” and “pain” are insufficient for determining medical necessity because there is no diagnosis code capturing the fall or trauma. To code to the highest level of specificity, thus gaining maximum reimbursement, documentation such as “patient fell, injury to right knee” or “patient involved in trauma, injury to left arm” is required. • Exams: The views of the extremities are vital in assigning the correct procedure code. Radiology reports must state how many views were taken and the anatomical side imaged. Separate paragraphs should be documented on each side within the body of the report. Always include an impression of the findings, such as “X-ray of the right knee, three views.” This is where the coder would like to see the verbiage posterior-anterior, lateral, and oblique mentioned in the dictation. • Technique: The technique in CT is important for determining the appropriate CPT code, as there is now a combined CPT code for CT abdomen/pelvis (74176, 74177, and 74178). As of this year, there is a combined CPT code for CT angiography (CTA) of the abdomen/pelvis (74174). It is suggested that the name of the contrast and the dosage amount be included in the technique. If using a template, this can cause a medical necessity disaster for the coder, who is then left trying to match the order from the referring doctor to the title of the CT to the technique provided in the dictated report. After a CTA scan is completed, computer processing is used to create 3D images; these images may then be viewed, filmed, and stored in multiple planes and projections. As computer processing is necessary to generate this information, it requires additional time and expertise. The phrase “including image postprocessing” in all CTA definitions relates to this part of the procedure. For this reason, a separate charge for reconstruction (76376 or 76377) is not submitted. The technique in MRI studies is the same as CT. Was the MRI done with or without contrast? This is where the referring physician’s order comes into play. Additionally, does the title of the exam match the technique? The name of the contrast and the dosage are also key elements. • Ultrasound: Ultrasound of the complete abdomen (76700) needs to include in the body of the dictation verbiage of abdominal organs, liver, gallbladder, common bile duct, pancreas, spleen, kidneys, aorta, and inferior vena cava. If an abdominal ultrasound is performed and not all of the abdominal organs are discussed, the procedure is coded as a limited ultrasound (76705). This covers a single organ being examined, such as the liver. Recently, there have been many changes in the coding of extremity ultrasounds. Complete ultrasound (76881) is the evaluation of either the upper or the lower extremity joint. A complete study requires certain elements or anatomy of the joint be evaluated. A limited evaluation of the upper or lower extremity joint (76882) is reported by giving a patient’s signs and symptoms for joint tendons. This code is used to report a mass in the soft tissue of the extremity. The dictation of these CPT codes needs to be very specific, as it relates to the extremity joint. Doppler color flow can be coded separately; however, it should not be reported as part of a routine protocol for ultrasounds. • Nuclear medicine: Nuclear medicine has seen a change in CPT coding for the respiratory system. Pulmonary ventilation scans now include aerosol or gas in the definition of the code (ie, 78579). — Sharon Blank, CPC, is a member of AAPC and former president of the Kansas City chapter. She has worked for the University of Kansas Physicians for the past 15 years and has more than 29 years of experience in radiology coding and billing.